Check below for this week’s full patch notes which includes buffs to Kael’thas and Tychus, nerfs to Illidan and Li-Ming, and a variety of other changes — including buffs to a number of underused ultimates across Support and Warrior heroes. We’re planning to release a new Balance Update for Heroes of the Storm on Tuesday, April 12, in order to apply a number of balance changes and a bug fix. We shouldn’t need to bring the Nexus offline in order to roll out the Balance Update, but we’ll be sure to let you know if that changes. You can find the complete list of adjustments we’ll be making with this week’s Balance Update listed below. Maximum charges reduced from 2 to 1. Duration increased from 1 to 1.5 seconds. While we feel that Dampen Magic has done its job of mitigating Ability Damage, it also has so much uptime that it can be difficult for enemies to know when is a good time to fire off their full damage output. We’re removing the second charge and increasing its duration, which should make it a bigger moment and help enemies to more easily know when the time is right to attack. Cooldown increased from 40 to 60 seconds. Mighty Gust is an incredibly powerful ability that we had been giving buffs to for a long time in an attempt to get more players to pick it (and win!). It seems that after a long period of time, players have learned how to properly play with and against the Heroic, and now it’s time to undo some of those former buffs. Increasing the cooldown should reduce cases where Mighty Gust is used frivolously, but it should still be a powerful disengage and playmaking Heroic. Heal amount granted per Basic Attack decreased from 40% to 30% of damage dealt. Basic Attack Healing during Sweeping Strikes decreased from 60% to 50%. Range bonus decreased from 33% to 20%. Block charges granted after casting Dive reduced from 3 to 2. Damage bonus increased from 100% to 125%. Cooldown reduction is now also granted when Sweeping Strike hits non-Heroic enemies. Cooldown reduction decreased from 5 to 4 seconds. We’re pretty happy with the Talent diversity and playstyle that Illidan has after the Talent Update, but he’s a little too hard to kill right now. We’re aiming to remove a little of his “snowball” survivability when he’s ahead by reducing the healing from his Trait and nerfing a few of his over-performing survivability Talents. We’re also providing small buffs to a few Talents that we think add fun and interesting gameplay decisions to Illidan, but aren’t winning as much as they should (such as Battered Assault and Unbound). Health increased from 1465 to 1520. Health Regeneration increased from approximately 3.05 to 3.17 Health per second. Damage increased from 213 (+4% per level) to 320 (+4% per level). Flamestrike damage is no longer increased when empowered by Verdant Spheres. Damage dealt over time increased from 228 (+4% per level) to 252 (+4% per level). Explosion damage increased from 114 (+4% per level) to 138 (+4% per level). Cooldown decreased from 13 to 12 seconds. Mana cost decreased from 85 to 80. Mana restored after hitting an enemy Hero decreased from 85 to 80. Bonus damage taken by enemies hit increased from 25% to 30%. We’re happy to see that there is now more counter-play to how Kael’thas delivers his damage, and his Talent pick rates have dramatically improved. However, he has a lower win rate than we would like. We intended Kael’thas to be weak against enemy Heroes who dive on him but feel that we may have gone too far. The changes to Flamestrike’s range should help him poke enemies from a safer distance (and build those Convection stacks! ), and Living Bomb’s changes should help him be more threatening to enemies who want to stand toe to toe with him. The change to Flamestrike’s base damage should help motivate players to use empowered Gravity Lapses more often, as they won’t lose potential Flamestrike damage when hitting stunned enemies. Health restoration decreased from 25% to 20% of maximum Health. Damage reduced by 10% overall, from 150 (+4% per level) to 135 (+4% per level) initial damage, and 450 (+4% per level) to 405 (+4% per level) damage at maximum range. Cooldown decreased from 10 to 8 seconds. Mana cost reduced from 50 to 40. Cooldown reduction decreased from 6 to 5 seconds. No longer causes Triumvirate to deal reduced damage to enemies that are close to Li-Ming. Area of effect reduced by 10%. Minimum amount of damage taken in order to refresh Teleport’s cooldown increased from 15% to 20% of maximum Health. Cooldown increased from 20 to 30 seconds. Li-Ming has settled into a fairly healthy win-rate, and we are mostly happy with her overall performance in the Nexus. Now that we have a good chunk of data we are pushing a few changes to help level out her talent pick rates, which should increase her already amazing build diversity. We are also making a few balance tweaks in order to lower her burst potential, while also increasing the appeal of some of her Arcane Orb talents. Disintegrate’s low cooldown is allowing players more lane-clear versatility than we are comfortable with. We have increased the cooldown to make players think a bit more about how and when to use the ability. Stun duration reduced from 1.5 to 1.25 seconds. We want to make some basic improvements to a lot of the lesser-picked/lower win-rate Heroic Abilities. Most of these are pretty simple changes to make them more enticing, like adding more damage, reducing cooldowns, or lowering Mana costs. We realize that the primary use case for Abilities like Li Li’s Water Dragon or E.T.C.’s Stage Dive is not damage, but having more of it might help them feel more effective. We’re trying to do something a little bit different with Brightwing’s Emerald Wind and Malfurion’s Twilight Dream by compensating for some of the Support capability you miss out on by picking these Heroics. We’re excited to see how these go! In Thrall’s case, Sundering was a little too strong, so we’re reducing its stun duration. Health increased from 1669 (+4% per level) to 1836 (+4% per level). Health Regeneration increased from approximately 3.48 to 3.83 Health per second. Attack Speed bonus per stack decreased from 2% to 1%. Maximum number of stacks increased from 10 to 15. Damage bonus increased from 1.5% to 2% of the target’s maximum Health. Damage bonus increased from 3% to 4% of the target’s maximum Health. 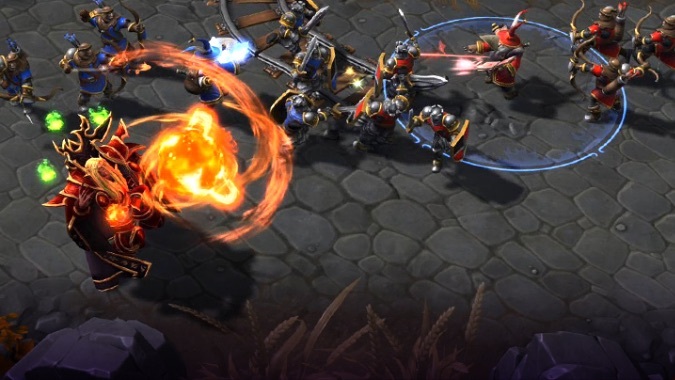 We’re generally happy with Tychus’ new role as the destroyer of high-health enemies. His new talent options are mostly providing good talent diversity. Master Assassin is a bit overtuned and players are finishing the quest too quickly, so we’re nerfing it and adding to the time it takes to complete. Overall, Tychus is too weak, so we’re sharpening his role. Increasing his trait damage from 1.5% to 2.0% will make sure he shreds those high health warriors even further, while the health increase will let him turret on his target longer and trade better. Maximum Minion stacks increased from 30 to 40. Health increased from 931 (+4% per level) to 1000 (+4% per level). Please see Thrall’s Developer Comment above. Now passively increases Soothing Mist healing by 8%. Damage increased from 192 (+4% per level) to 318 (+4% per level). Mana cost decreased from 100 to 50. Now passively increases Malfurion’s Mana Regeneration by 1.5 Mana per second. Stun duration increased from 1.5 to 1.75 seconds. Damage increased from 201 (+4% per level) to 330 (+4% per level). Damage increased from 251 (+4% per level) to 365 (+4% per level). Damage dealt to secondary targets increased from 25% to 100% damage of Haymaker’s primary target damage. Fixed an issue which allowed Kael’thas to repeatedly cast Living Bomb for free under certain circumstances. Fixed an issue that prevented Kerrigan from casting Ravage on Earthbind Totem and several other summoned units. The tooltip for Sgt. Hammer’s Siege Mode will no longer reference a nonexistent Talent.